The Fall schedule of orienteering events in the Northeast is a bit light on "A" Meets this year, but EMPO has its usual slate of wonderful offerings, and there are other events being put on by the various other "O" clubs nearby. Autumn is really the best time of the year for orienteering, and even the drive to an event can be a beautiful part of a fine day. Because of the dry summer we've had, some of the leaves are already starting to turn color now, in late August, so we have the prospect of a long "leaf peeping" season to brighten our travels. The two "A" Meets which are scheduled in the Northeast are both near us in the Hudson Highlands to the south. The first, in September, is at West Point. This event is always a lot of fun for everyone. The adults like it because they enjoy being called "Sir" and "Ma'am" by the cadets; the kids like it because it's cool to play, hang out, and sleep over at an army base. Most of the woods in the area are pretty open, making it a fine place for orienteering, unless the weather is really rotten. And with the relatively early date this year, it's unlikely to get too chilly, even if it rains. The second "A" Meet is just a few miles further south, in Harriman State Park. This one is a fund raiser for the US Orienteering Team, so besides being fun in itself, your attendance will help support the athletes who will be competing for us in the World Championships. The courses will be on maps that were created for the World Championships when they were held here in 1993, and they are still some of the best around. On EMPO's own agenda are two places we haven't been in awhile, and one we've only seen with snow. Things start off in September at Washington Park in Albany. While it doesn't have the size of, say, Central Park in New York City, there's still plenty of room to run, or walk. This will be a one hour Score-O format, so you'll have plenty of time to see it all. Next, in October, we go out of town a bit to Lapland Lake Cross Country Ski and Vacation Center. We were just there at the end of the Winter for that season's final Ski-O, and now we'll get to see what it looks like during on should be a prime leaf viewing date. This event is EMPO's Third (Annual?) MtB-O (mountain-bike-O). Each year our attendance has increased a bit, and this time we're changing things by adding courses for runners/walkers/hikers too. So, if you have a mountain bike, come give this different kind of "O" a try; but even if you don't, come on out anyway for what should be a beautiful day at a wonderful place. Finally, our Club Champs Meet will be held on a newly revised version of the venerable Colonie Town Park map. One of my own personal problems when I first started orienteering was that I simply couldn't figure out black & white O-maps. I would regularly confuse contours with trails, and end up getting thoroughly befuddled. While unfortunately there's no way to wave a magic wand, or even use some new technology and "colorize" the old B&W maps like they have with old movies, one can use OCAD to re-trace scans of old maps. That, plus a little old fashioned field work, is producing a "new" batch of maps for us. In the Spring we had a new color version of the Norray Farm map. This season it's Colonie. Next I hope to do Five Rivers. This should help get us enough locations to keep our schedule full and varied without resorting to black & white ever again. So, there are some great places, maps, and events lined up for this season. Come join us. And remember, if you want to get to some event a bit further away, but can't drive yourself, check with any EMPO club officer or Meet Director about who else might be going, because it might be possible to get a ride. You're in great shape. You're ready to charge through this course! You get your map and take off! Ten minutes later you're still looking for the first control, on a 500 meter leg, and you're not even sure exactly where you are. Has this happened to you? If it has, you're far from alone. It can happen to anyone, and probably has happened to most orienteers at least once. The solution is to start out in control, stay in close contact with the map, and increase your pace as you become more comfortable and able to relate what you see to what is shown on this particular map. It's analogous to the situation in most other distance races, on foot or a bike or a canoe or skis or whatever, in that what you want to do is hold or improve on your time per kilometer or mile as you go along, not charge out and collapse. Since orienteering races are usually staggered rather than mass start events, you don't have the pace of the rest of the competitors to compare yourself against. You have to be smart (remember: orienteering is "the thinking sport"), and develop the correct pace for YOU on THIS day on THIS map. First, if you're in a new area, wander out in the woods a ways (before the start) to get a "feel" for the area. Look at the vegetation, the ground clutter, the general lay of the land. Think what would make good navigation markers, and what should be ignored. If you're lucky enough to have an old map of the area, then take it along to get a feel for the mapper's style. Second, take the first control *slow*. When you first get your map, navigate to something obvious that is away from the start, and in the general direction of your first control. Once there, calm down and determine your attack point for the first control. Then work out your route to the attack point. If there is a nice set of handrails to the attack point (even if it's a longer route), take the handrail route -- it'll give your mind a chance to get into the groove. Whatever you do, don't let the competitive pressure / excitement make you cut corners. Heck, it doesn't hurt to *walk* the first leg, if it's the only way to make yourself slow down. I've seen championship level orienteers literally stand still with their maps at the start for what felt like ages, to make sure they understood what they were going to do before they started doing it. Make sure you start off your next course on the right foot! These "crazy guys" (in their official team hats) represented EMPO and the Capital District at the US Scholastic Championships in May. They didn't win it all, but they did all give it their best and finish their courses. They are all going to head down to West Point this September to take their shots at the Northeast Champs, and just to have fun. Join them, and the rest of the EMPO "Travel Team" at one of the best events of the year! "I had a great time at the scholastic championships. There were a lot of people I knew there (including my friends Jack Norray and Kris Geist, who were part of the Berne-Knox-Westerlo team). 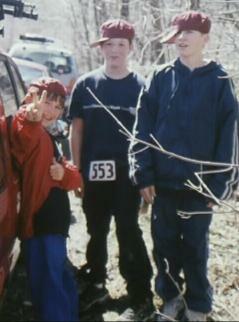 The mornings were comfortably cool for our races; and then we played lots of kickball games." 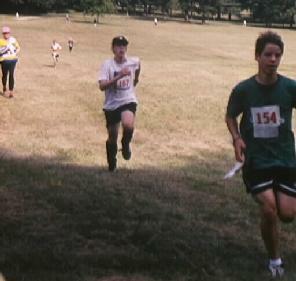 The 1999 configuration of the EMPO Relay Team journeyed to the sweltering lowlands of southeast Pennsylvania for the 1999 US Relay Championships, a part of this year's USOF Convention and O-Fest. The format for this race can vary from year to year, but for the last several it's been a combination of several different levels of difficulty and distance. No matter how it's billed, though, the separate legs generally seem to be around an Orange level of difficulty, but with distances appropriate for the Yellow, Orange, Green and Red courses. Certainly that's how it was this year. And, continuing on their upswing after several early years of disasters, the EMPO squad acquitted themselves very well. Notable accomplishments were besting the "8 Point" teams of our older and larger neighbors to the West (CNYO), North (UNO), East (NEOC), and South (HVO). Well OK, the number one NEOC team won, but we beat two other NEOC units, and in total finished 7th out of 36. 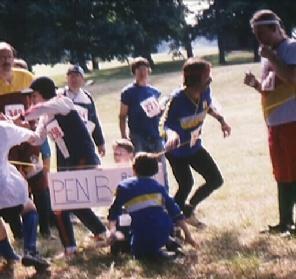 Also noteworthy was that it was essentially the younger generation which put us in position to finish well, as Greg Tryson and Marty Hawkes-Teeter had us ahead of CNYO by almost 11 minutes after two legs, while their fathers squandered that lead to 4:20 after the third leg, and then 14 seconds at the finish. While most of the Convention and O-Fest were conducted in sweltering and steamy conditions, the Relay day at Valley Forge was graced with about the least oppressive weather of the entire week of events. Maybe it was a lingering chill from the winter of 1777. Valley Forge National Historical Park is a beautiful place, and as the day wore on it became filled with all sorts of folks walking, running, biking, roller-blading, horse-back riding, and auto-touring through the bright sun and verdant hills, many of whom were trying to figure out just what the people in the brightly colored pajamas were running around for. The deer couldn't figure it out either, as they kept getting spooked from whatever quarters they thought they could settle down in. But they all seemed to accept us as we and they gloried in our different ways of enjoying a terrific day. And we're just one person short of having enough for TWO teams. So come on, sign up next year! One other note from the O-Fest: the US Short Course Championships and Night-O Championships were also contested. Sadly EMPO had no Short Course US Champions this year, but Janet Tryson in F-45 and Marty Hawkes-Teeter in M-14 each came in 2nd, by 3:36 and :05 respectively. Rob and Greg Tryson also finished "in the money", taking 3rd in M-12 and M-16. But finally Janet broke through in the Night-O, and brought home EMPO's sole US Championship of 1999, in F-45, crushing her competition by over half an hour. The rest of the EMPO group can only look forward to a final Championship shot at the US Long-O Champs at the end of October.